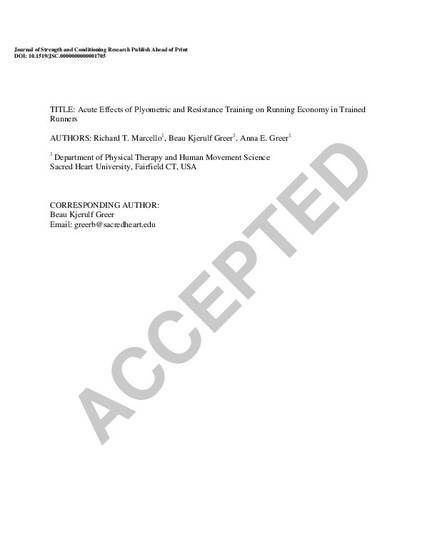 Results regarding the acute effects of plyometric and resistance training (PRT) on running economy (RE) are conflicting. Eight male collegiate distance runners (21 +/- 1 years, 62.5 +/- 7.8 ml/kg/min V[Combining Dot Above]O2 peak) completed V[Combining Dot Above]O2 peak and 1 repetition maximum (1RM) testing. Seven days later, subjects completed a 12 minute RE test at 60% and 80% V[Combining Dot Above]O2 peak, followed by a PRT protocol or a rested condition of equal duration (CON). The PRT protocol consisted of 3 sets of 5 repetitions at 85% 1RM for barbell squats, Romanian deadlifts, and barbell lunges; the same volume was utilized for resisted lateral lunges, box jumps, and depth jumps. Subjects completed another RE test immediately following the treatments as well as 24 hours later. Subjects followed an identical protocol six days later with condition assignment reversed. RE was determined by both relative V[Combining Dot Above]O2 (ml/kg/min) as well as energy expenditure (kcal/min). There was a significant (p < 0.05) between-trial increase in V[Combining Dot Above]O2 (37.1 +/- 4.2 ml/kg/min PRT vs. 35.5 +/- 3.9 ml/kg/min CON) and energy expenditure (11.4 +/- 1.3 kcal/min PRT vs. 11.0 +/- 1.4 kcal/min CON) immediately post-PRT at 60% V[Combining Dot Above]O2 peak, but no significant changes were observed at 80% V[Combining Dot Above]O2 peak. Respiratory exchange ratio (RER) was significantly (p < 0.05) reduced 24 hours post-PRT (0.93 +/- 0.0) as compared to the CON trial (0.96 +/- 0.0) at 80% V[Combining Dot Above]O2 peak. Results indicate that high intensity PRT may acutely impair RE in aerobically trained individuals at a moderate running intensity, but that the attenuation lasts less than 24 hours in duration. Version posted is the authors' accepted manuscript.